Hover over each community to learn more about it and search all homes and listings in that area. Known for combining big city amenities with a small town atmosphere, Airdrie is a safe and friendly city that predominantly attracts young, active families. Its proximity to the urban centre of Calgary makes it an ideal choice for north east commuters, while a robust selection of shopping and leisure facilities are available right within Airdrie's city limits. Originally used for dairy farming, the Bearspaw region now offers a variety of real estate options including a mix of planned subdivisions, acreages, farmland, and ranches. Bearspaw Meadows, Bearspaw Acres, Bearspaw Ridge, Bearspaw Summit, Bearspaw Village, and Bearspaw Country Estates together make up the Bearspaw Region. A quiet retreat from the hustle and bustle of urban life, the village of Beiseker provides a family-first atmosphere that values cooperation, caring and community spirit. Approximately 800 people call Beiseker home, and the thriving community includes its own community centre, ice arena, and a bustling municipal airport. The hamlet of Bragg Creek is surrounded by alpine meadows and vast forests against a backdrop of the majestic Rocky Mountains, and has earned a reputation for being a "kind of heaven" in the region: its no wonder the area attracts so many artists! Residents here embrace a rural lifestyle, and appreciate Bragg Creek for being close – but not too close – to Calgary. The town of Chestermere combines laid-back lakeside living with all the urban amenities your growing family needs to lead a healthy, active lifestyle. The heart of the town centres around 750 acre Chestermere Lake, which plays a central role in many of the yearly events and festivals. With 15,000 residents, Chestermere's business and service communities are expanding and welcoming to newcomers. A mere 20 minutes drive from Calgary and less than an hour from Banff, the town of Cochrane is a haven for outdoor enthusiasts, and those who are still cowboys at heart appreciate the community's western heritage and handshake hospitality. Set in a landscape of rolling foothills along the banks of the Bow River, Cochrane enjoys spectacular views of the nearby Rocky Mountains. Originally a flag stop for the railway, the hamlet of Conrich is named after two real estate developers, Connacher and Richardson, who worked in the area. The community sits on the doorstep of Calgary's northeast along McKnight Boulevard, providing residents fast and easy access to the city and all its amenities. The town of Crossfield sits on a natural ridge 30 kilometres north of Calgary along the Edmonton-Calgary corridor. Home to approximately 3,000 people, Crossfield is a progressive community with a booming agricultural, industrial and natural gas industries, making it an ideal place to live, play, and work. Irricana embodies everything there is to love about small-town Alberta living. Located 50 kilometres northeast of Calgary, the town provides a safe and comfortable place to raise a family while embracing a rural lifestyle. Community spirit is everywhere in Irricana, and local developers are keenly interested in this fast-growing community which is only a 35 minute drive from Calgary and Airdrie. Steeped in heritage and full of community spirit, Langdon’s streets are named in honour of the families that first choose Langdon as their home over a century ago. Known as "The Good Luck Town", development within this area fosters a love of the prairies, the historical admiration of the past, and a respect for tradition. Over the years Springbank has seen a vast transformation from being a rural community of farmers and ranchers to an area known for its high end estate and acreage living. Located just west of Calgary along the Trans-Canada Highway, Springbank puts the pleasure of country living at the doorstep of the city, allowing for easy access to all amenities and quick commuting. Selling? Get a Free Rocky View Evaluation! Question about Rocky View? Give Us a Call! Rocky View County surrounds Calgary, bordering the city on its west, north, and eastern sides; in fact, Rocky View and Calgary share one of the largest municipal borders in the country! Covering almost 3,900 square kilometres and set where the foothills of Alberta's southwest meet the open prairie and grasslands, the landscape of Rocky View is as varied as the people who live there. To the west sit the mighty Rocky Mountains, providing spectacular views for Rocky View residents west of Calgary. Here you'll find a mix of family farms, working ranches, small acreages, country residential communities, light oil and gas industrial operations, and commercial developments. 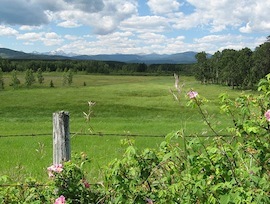 With a population of 36,000 living in 11,600 homes across the county, Rocky View features a unique mix of urban and rural communities including the city of Airdrie immediately north of Calgary; the towns of Chestermere, Cochrane, Crossfield, and Irricanna; the village of Beiseker; and over a dozen small hamlets and country communities including Bearspaw, Elbow Valley, Bragg Creek, Conrich, and Langdon. The horseshoe shape of Rocky View means everyone in the region is within commuting distance to the city. Rocky View offers a wide range of real estate that caters to every lifestyle imaginable. You can settle down in a quiet suburban neighbourhood of Airdrie or Cochrane, communities which offer a wide selection of urban amenities, or find a quiet acreage property with a mountain view where you can escape the hustle and bustle of the big city every night. Embrace the know-your-neighbour atmosphere of smaller towns and communities like Bragg Creek, Conrich and Irricana where community spirit is thriving and life moves at a slower pace. The Rocky View real estate market has something for everyone, whether its a starter home or condo, an acreage small or large, or a sprawling estate home in one of our prestigious country residential communities. Imagine starting every day with the magnificent beauty of southern Alberta stretched out uninterrupted before you, just outside your door. Rocky View residents west of the city wake up every morning amid the rolling foothills and forests with the snow-capped Rocky Mountains rising up from the horizon, while those living in Rocky View's east experience the endless open skies of Alberta's prairie grasslands. East or west, living in the Rocky View countryside will allow you to rediscover the joys of a simpler life surrounded by nature and with local wildlife as your neighbour. Families quickly fall in love with life in Rocky View County and how easy it is to blend a rural, small town lifestyle with quick access to every amenity and service they could possibly need. Many communities have feature parks, community halls, and other local facilities available for resident's use, while the nearby cities of Calgary and Airdrie provide all residents of Rocky View quick access to major attractions, entertainment options, and every urban amenity imaginable. The brand new Cross Iron Mills shopping centre located just north of Calgary in Rocky View is the largest single-level shopping complex in the Province and features over 200 retail stores, restaurants, and entertainment outlets. Rocky View is serviced by the Rocky View School District, which operates 40 schools in the county. As on of Alberta's largest school boards, Rock View Schools offers a range of programs including French Immersion, Advanced Placement, and English as a Second Language streams. The Calgary Catholic School Division provides two schools with faith-based curriculums in Rocky View: Holy Spirit School in Cochrane, and Our Lady Queen of Peace school in Airdrie. Those living on in the west region of Rocky View love how fast and easy it is to escape to the mountains and beautiful nearby Kananaskis Country. Outdoor enthusiasts thrive in Rocky View, enjoying immediate access to a wide range of activities like hiking, skiing, mountain biking, quadding, kayaking, swimming, golfing, and camping.